A classic 70's dish, 7-Layer Salad can be made a day ahead, easy to carry to gatherings, lovely to look at when assembled in a glass bowl. It is certainly a crowd pleaser. 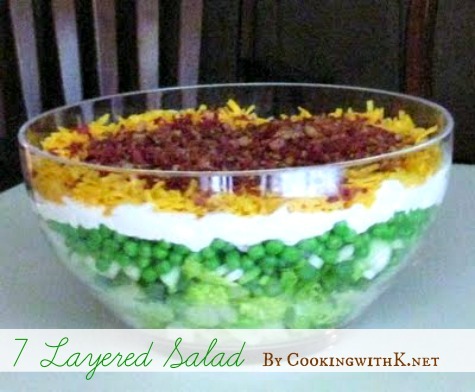 The 7 Layered Salad has been around for a long time even though as a newlywed in the 70's, I thought that it was my Mother's original creation (smiles). You could guarantee that this salad was going be on our Thanksgiving and Christmas menu. The salad is an easy dish to put together and looks magnificent when you're done. You can vary the ingredients according to your tastes although, peas are traditional. The biggest choice is whether to use mayonnaise or salad dressing? Mother used Miracle Whip, but my husband is a huge fan of mayonnaise, so that is what we use today! Fry the bacon crisp, drain it and put on paper towel to remove as much grease as possible. Shred the lettuce and spread in a layer on the bottom of a large salad bowl. Add a layer of celery. Then a layer of green onion. Then a layer of frozen peas. Add the peas frozen, don't thaw them. Keep each layer separate, don't mix together. Spread mayonnaise in a layer on top of the peas. Sprinkle the cheddar cheese over the mayonnaise layer. Add the crumbled bacon on top. Cover with food wrap or foil and refrigerate overnight. I love this recipe! It looks gorgeous! I think for me I would leave the dressing on the side. My Mom makes this every Thanksgiving and Christmas! It sounds like exactly the same recipe too. If not, then pretty darn close. Everyone loves it, it's one of my favourite dishes. These salads are great, good keepers until it is time to toss and enjoy. Thanks. With all this regular blogging and trying to come up with new recipes, I sometimes forget the oldies but goodies like this one. It's time to break this one out again as my salad for Thanksgiving. My mother didn't make this, but it shows up often at pot lucks and church dinners where I live. It's yummy and always looks so pretty. It's a winner for the holidays. My grandmother always made it for the holidays and I too thought it was her creation!! Thank you for snagging my button!! Layering a salad ... what a lovely idea!!! I sure hope that mine turn out as good as yours. great recipe!! Saw this on Pinterest. It's something I make for most potlucks I go to but my "dressing" is one packet of Hidden Valley Ranch dry dressing, 8 oz of mayo and 8 oz of sour cream. Soooo yummy. Yes...this dressings sounds like a hit. Thanks for sharing and adding option to an already great recipe. I will use this dressing. 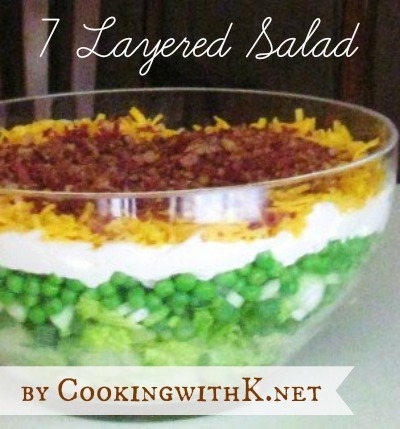 Mmm I love 7 layer salads too! Yours looks so good and beautiful, too! I love how you get so many different flavors in one scoop! Yum! Yum have been craving this! Just like my mom's! I don't think I've had this particular version. Will have to pin it and try it! Sounds good!! Thanks for sharing! Looks good, although I am a mayo girl. Gotta love a granny recipe! Can't wait to get to your recipes next! Thank you Brittany...happy you stopped by and welcome to CWK! The size bowl I use I am guessing is probably around a 3 qt or 4 qt size. It's the size of an average punch bowl. Hope this helps.